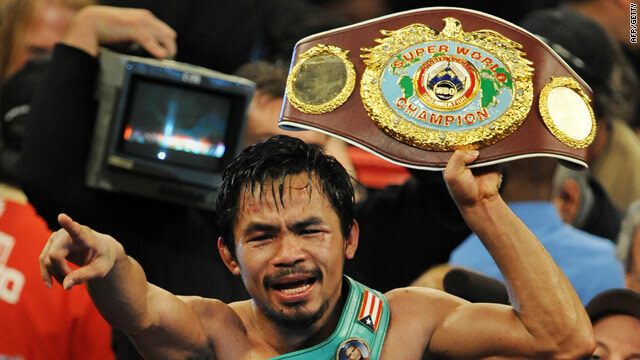 Pacquiao's incredible displays have made him one of the hottest properties in world boxing. (CNN) -- Manny Pacquiao is aiming to deliver a knockout blow to Floyd Mayweather Jr. in the U.S. courts after filing a lawsuit against the American and his connections over claims he used performance-enhancing drugs. The lawsuit, lodged in the Las Vegas district court on Wednesday, names Mayweather, his father Floyd senior, former boxing star Oscar De La Hoya and fellow Golden Boy Promotions executive Richard Schaefer. "Calling a professional athlete a cheater is the most serious charge one can make," the lawsuit says, "and in today's world, accusing an athlete of using performance-enhancing drugs -- however baseless and lacking in evidence -- is toxic." The Filipino fighter, who has won world titles at five different weights, was slated to fight Mayweather on March 13 next year in a money-spinning bout in Las Vegas. But he was infuriated by the insistence of Mayweather's camp that he undergo Olympic-style pre-fight blood testing and the alleged implication that he had used illegal drugs. Pacquiao posted a Christmas day message on his personal Web site, saying he would take legal action and has now followed through on the threat. Top lawyer Daniel Petrocelli is representing him and outlined the substance of their case. "Manny Pacquiao's achievements come from God-given talent and an indefatigable work ethic -- not steroids," he told gathered reporters. "He cannot and will not allow others to deliberately misrepresent his years of hard work and tarnish his reputation." The lawsuit seeks damages in excess of $75,000 dollars and also cites interviews given in various publications that appeared to question the fairness of Pacquiao's pre-fight preparation. Mayweather's connections attempted to diffuse the situation in a statement issued earlier this weak on the Golden Boy Promotions Web site. "Let it be very clear that nobody from Team Mayweather or Golden Boy Promotions is accusing Pacquiao of anything," it read. "But the reality seems to be that for whatever reason Pacquiao does not want to participate in random blood testing, which has already been deemed a harmless procedure that many current athletes are subjected to prior to and during competition," it added. Many viewed the war of words between the respective camps as a pre-fight war ploy to boost interest, but the row over dope testing may well have derailed one of the richest fights in boxing history, with huge pay-per-view revenues forecasted. The Los Angeles Times reported on Wednesday that Pacquiao's promoter Bob Arum was pessimistic about a March showdown between the two fighters. "This is only my opinion, but I don't see the fight happening now," he was quoted. Positions are hardening ... Manny's fit to be tied. He's very angry." Arum was also reported to have opened negotiations with World Boxing Association super welterweight champion Yuri Foreman to fight Pacquiao.